Shoot many robots – Shooting stuff is fun. Seriously, it’s that simple, the shooting mechanics are straightforward and the various weapons all genuinely play out differently. From piercing pistols to mowing machine guns, the basic weapons in the game are fun and easy to get used to. The special weapons really help spice up the game, and provide options ranging from a myriad of different kinds of rocket launchers to freeze rays to decoy mines. Being given options is always awesome, and while the basic guns aren’t mind blowing, they’re definitely fun to master. Loot many robots – Finding stuff is just as fun. There’s a rather impressive amount of loot in this game. 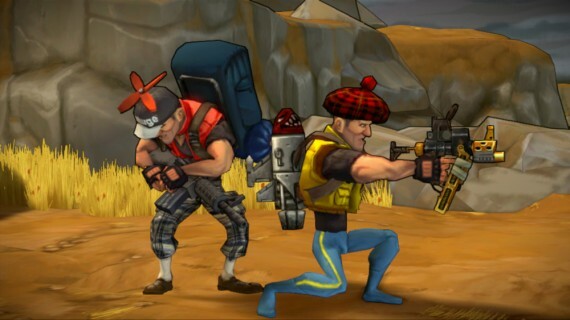 Special bots and crates (and sometimes random things) drop loot for regular or special weapons or for a top, bottom or backpack. Leveling to 50 (the last loot is at level 50) will take around 20 hours and last until Insane difficulty, all the while players will accrue tons of loot! Replaying levels grants more loot, and loot, then loot and just take loot to loot loot loot. Get the picture? Be who you want to be – Beyond the awesome weapon choices that allow players to deal with enemies in many different ways, the equipment will vastly affect the approach to the each level. Some equipment will give tons and tons of health so players can literally tank bullets for the team, while some will give grant incredibly powerful melee attacks. Whether players want to play solo or be part of a team, the options available are extensive and comprehensive. Some of them are also hilarious, like the baby carrier granting +1 Babies or the powdered wig granting +8% dignity. A few of the effects are in the gameplay as well, such as the astronaut’s helmet granting low gravity. 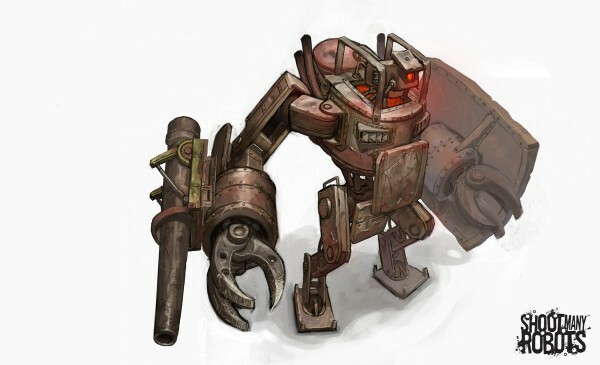 Constant actiony action – There’s a constant stream of bots to deal with while traversing each level combined with a healthy dose of scripted encounters. 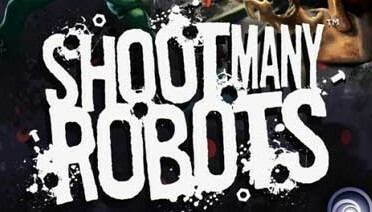 Shoot Many Robots provides about 12 different types of bots to shoot, most of which are either humanoid form or a small boxy droid form and each present a different element of danger. The mix and blend of each bot type in encounters makes every shoot out dynamic, sometimes allowing players to camp a side of the screen and count on their aim, sometimes forcing them to jump, slide and glide out of danger. Solo is a bit more difficult than co-op thanks to this, but it’s totally doable all the way up through normal and into hard. Co-op, however, is definitely the way to go with Shoot Many Robots thanks to the great combination of equipment and weapons that comes from a few extra players. Finally, a shooter with character! – Demiurge wins big time for their writing in Shoot Many Robots. No no, not because there’s a brilliant narrative (there isn’t) or due to deep character development (nope), but because of the deeply hilarious bits and pieces strewn throughout the game. There are tons of guns like the 110%-American which grants +15% patriotism, or the Baby Carrier which grants you +1 babies. The loading tips are hilarious as well, saying things like “It’s impossible to tell which P. Walter Tugnut is which when they switch jackets” (because their colors are indicated by their jackets). Hee hee! Haven’t I been here before? – While the encounters are fun over and over again, it’s painfully obvious that the environments were reused. 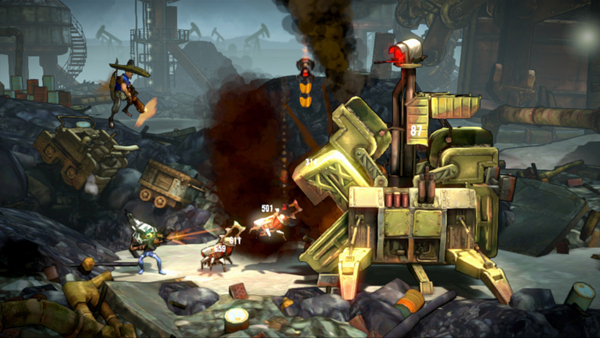 Each level is either a go-right progression level or a survival level and after a point players will start to recognize the recurring backgrounds. In hard and insane mode the encounters change and are of course more difficult, but there are no new environments which is unfortunate. Thankfully, the environments really aren’t that big of a deal, but it does gives off the feeling of “I’ve been here before”. Boss? What boss? Where? – Boss battles are almost always horrible. Usually they’re too difficult, or too estranged from the normal gameplay, but in this case they’re ridiculously easy. Nobody likes having tons of tiny enemies to deal with while fighting a boss, but when Shoot Many Robots invites players to simply shoot one robot, the game is ridiculously easy. Much like the environments, easy bosses isn’t a big deal, but it’s unfortunate that since they exist they couldn’t be more enjoyable. Shoot Many Robots really is all in the name. The gameplay is straightforward and accessible but surviving will challenge players enough to really give the gameplay life. 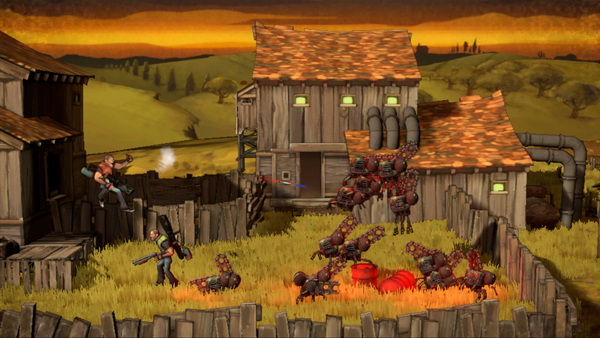 Each encounter forces players to take advantage of their weapon selection and equipment to come out on top. Four player online and/or offline co-op is awesome just because it exists, and luckily it’s also an incredibly fun way to play. The character and wit in this game is exemplary, even if the environments come up a bit short. 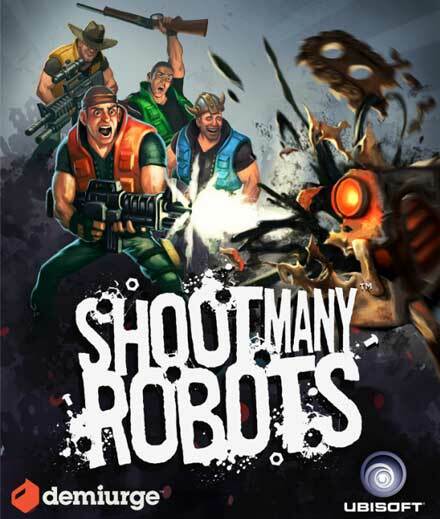 All the gunplay, RPG-esque character customization and co-op gameplay solidifies Shoot Many Robots as a sidescrolling shooter to be reckoned with– all for only 800 MSP!